KIEV, Ukraine -- On a Sunday in December when the Ukrainian uprising seemed about to tip into wide-scale violence, Petro Poroshenko, a pro-Western billionaire, thrust himself between antigovernment protesters and riot police officers clashing outside the presidential headquarters, climbed on a bulldozer that was threatening to plow through the crowd and grabbed an orange plastic megaphone. “Friends, calm down,” he shouted, as pro-government thugs brought in to antagonize the demonstrators cursed him and hurled anti-Semitic slurs, though he is a member of the Ukrainian Orthodox faith, not Jewish. As chaos swirled, Mr. Poroshenko, 48, stood his ground, helping keep injuries to a minimum, but also cementing his status as a leader of the pro-European opposition and defying the stereotype of the superrich above it all. Now, with less than a week to go until a presidential election here, Mr. Poroshenko is once again at the center of a fracas that most of his fellow oligarchs would rather avoid. The latest polls show Mr. Poroshenko, a confection magnate known as the Chocolate King, as the heavy favorite, likely to avoid a runoff with his strongest opponent, former Prime Minister Yulia V. Tymoshenko. Ms. Tymoshenko insists that the polls are wrong and that she will surge ahead. A poll by the Kiev International Institute of Sociology, conducted April 29 to May 11, found Mr. Poroshenko supported by 34 percent of all voters, compared with 6 percent for Ms. Tymoshenko and 4 percent for Sergey Tihipko, a member of Parliament and former economics minister; 25 percent said they were undecided. The survey had a margin of sampling error of plus or minus three percentage points. Among voters who said they had made up their minds, Mr. Poroshenko was supported by 54.7 percent — enough to avoid a runoff — with 9.6 percent for Ms. Tymoshenko and 6.7 percent for Mr. Tihipko. With the country still roiled by separatist violence in the east, the growing air of inevitability around Mr. Poroshenko, who has deep business interests in Russia, has redrawn the Ukraine conflict. It has presented the Kremlin with the prospect of a clear negotiating partner, apparently contributing, officials and analysts say, to a softening in the stance of President Vladimir V. Putin of Russia. “You can have a kind of a civil war and this kind of gray zone and be completely separated and face a higher degree of economic sanctions,” said Adrian Karatnycky, an expert on Ukraine at the Atlantic Council, describing the choice facing Mr. Putin. 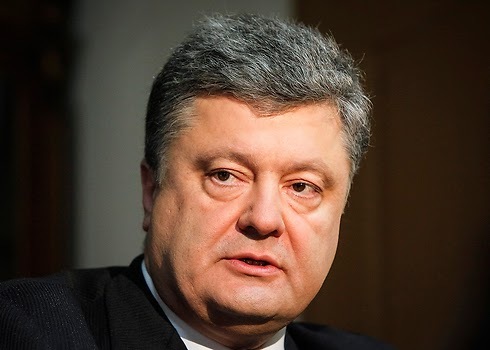 Mr. Poroshenko is a veteran of Ukrainian politics, having served as foreign minister under President Viktor A. Yushchenko; as economics minister under the ousted president, Viktor F. Yanukovych; and as a longtime member of Parliament, including a stint as speaker. “The reasoning on Poroshenko is that he is a pragmatist and he was in the Yanukovych government,” Mr. Karatnycky said. Exactly what Mr. Putin wants to get remains to be seen. Some analysts believe he wants a guarantee that Ukraine will not join NATO. Others think he will settle only for a federalized government that permanently weakens Kiev, while still others believe he will continue destabilizing the country. Recently, Mr. Poroshenko has struck a conciliatory tone, promising to mend ties with Russia and saying at a news conference on Sunday that he opposed holding a referendum on Ukrainian membership in NATO. He has also sought to bring normalcy to the campaign, assuring voters that he will provide security if elected but stressing a more traditional message: jobs. “A new way of life means to be well off,” Mr. Porshenko said, repeating his campaign slogan during a recent visit to a turbine factory in the eastern city of Kharkiv. In recent weeks, however, he has kept some distance from the provisional government, which is viewed with deep suspicion in the east. Mr. Poroshenko’s support for European integration will inevitably complicate his talks with Russia if he is elected. There is also a personal element to any negotiations. The Russian government has seized and closed a main factory and warehouse of his company, Roshen, in Lipetsk in southern Russia. Among Ukraine’s political cognoscenti, Mr. Poroshenko’s election is regarded these days as a foregone conclusion. “He is going to be president,” said Mustafa Nayyem, a reporter with the online news site Ukrainska Pravda who is leading a team preparing the questions for debates on Channel 1, the national television station. Mr. Poroshenko’s views already carry heavy influence in the provisional government in Kiev, including his belief that the government must crack down on armed insurgents in the east. In some respects, Mr. Poroshenko is already being treated as president-in-waiting. In recent weeks, he has been meeting regularly with world leaders. But while the West seems excited about the prospect of a Poroshenko presidency, some good-government advocates in Ukraine fear that Mr. Poroshenko’s business interests and his ties to other oligarchs may mean he would largely maintain the status quo. Mr. Poroshenko’s path to the presidency was eased substantially in March when his main rival, the former boxer Vitali Klitschko, agreed to drop out of the race, endorse Mr. Poroshenko and run for mayor of Kiev instead. The deal was reached at a meeting in Vienna orchestrated by Dmitry V. Firtash, the gas-trading tycoon, who was a longtime political patron of Mr. Yanukovych and has close business ties to Gazprom, the Russian state-controlled energy giant. Mr. Firtash’s role has raised concerns among some Western officials who are hoping to prevent a recurrence of surreptitious and corrupt side deals that have bedeviled Ukraine since Soviet times. During a recent 90-minute debate between Mr. Poroshenko and two other candidates, he seemed comfortable with the attention accorded him as front-runner. He spoke easily, his words punctuated by hand gestures. His positions were mostly uncontroversial, but with a clear Western bent.